Why do we prefer mediocre products over better quality ones? Why does rap sell more than pure jazz? Why do many of us gravitate to mindless movies instead of thought-provoking fare? Not just in music and film, even in literature, shallow novels outsell deep literary works. Beer and burgers are so satisfying to so many of us! Everywhere we are given a choice between profound and shallow, we go with shallow. I know I could be accused of being judgemental and subjective, but the low-grade product is "popular" the world over. Mediocrity sells!! Why? What's the logic? What it boils down to is that mindless conformity is the stuff of much of human social life. We settle for mediocrity in many aspects of our lives...in our jobs, our relationships etc. I think because it's easier to be stuck in a familiar rut or habit, even though it's depressing, than to look outside the habit and have a life that is more desirable. We are all terrified of change; failure is too scary because it involves taking risks. This is one of the main reasons people "settle" in life. It's not about unrealistic goals or perfection.... It's about changing what we can within ourselves to be happy....not merely drift along in life. We are all creatures of habit and we'll create endless excuses to justify our complacency and all that it will result in. So what is it really that we don't want to see? It is our looking back with regret and a slightly bruised ego, wishing we hadn't settled! We settle for many reasons...because we're scared to be alone, or we have self-doubt, or low self-value or our belief in our ability is so shaky. Another important point is that as technology evolves our levels of patience have been dwindling. We lack fortitude as a society....things worth having take time, commitment and faith which many don't want to exert. Again it is a battle against maintaining the status quo or challenging ourselves to be different. 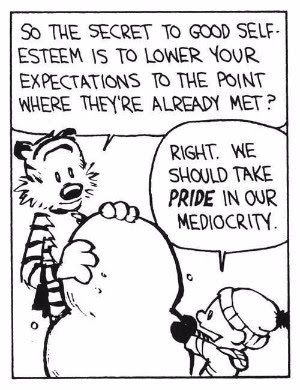 Mediocrity is a place where people often get stuck and do not know how to escape. In order to move from here to there, one must think differently, get rid of what hasn't worked, connect with those that can give more direction, design a plan for action and most importantly, put the plan in motion. Life is too short to settle for anything less than what we truly want. The moment you begin to settle in the most important roles in your life is when you begin a slow decline...it might sound harsh but it's a slow death really. Excellence is a place where people who refuse to settle for mediocrity live; it is where one reaps from all the hard work sown. It is a journey of continuous progression towards the goals in your life. Life is an opportunity and we can use it to express the best in ourselves. We need to step out of the crowd if we want to be above the average. The average person lives to meet others expectations....someone else's life. The average person chooses the safe rather than what makes them feel the best. Ask yourself, “am I doing what I want to or what I should?" And, absolutely, ask yourself, "Do I have a dream?" DARE TO HAVE A DREAM!